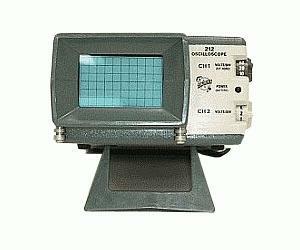 The Tektronix 212 is a Dual-channel portable Oscilloscope that is operated either from AC line voltage or from internal rechargeable batteries. The 212 has a maximum bandwidth of 500 kHz with vertical deflection factors from 1 mV/div to 50 V/div with a maximum usable input voltage of 600 volts peak-to-peak. Built of impact-resistant plastic with analog monochrome display.